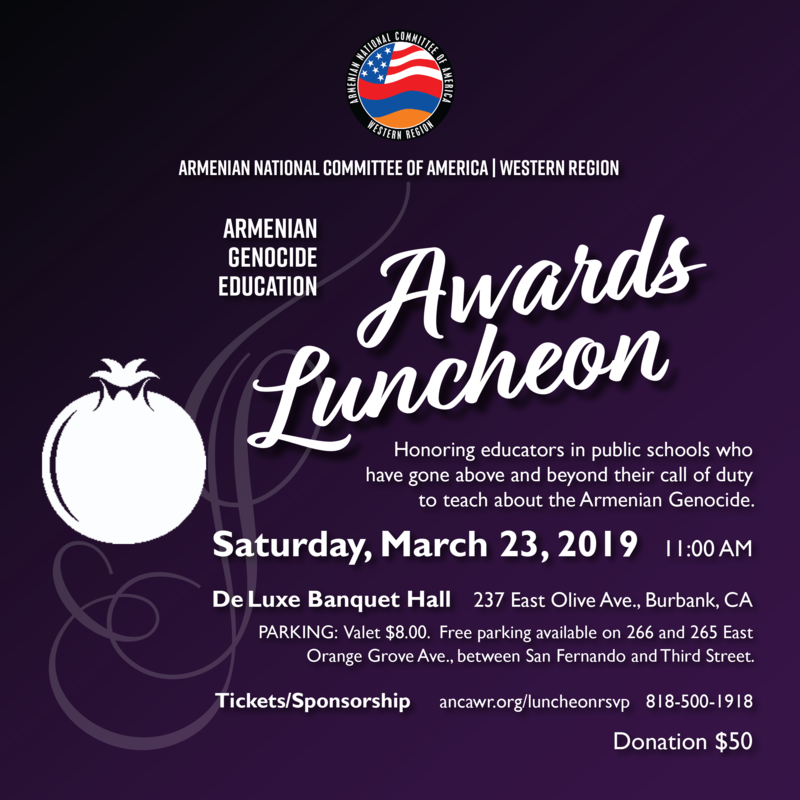 GLENDALE – The Armenian National Committee of America – Western Region (ANCA-WR) Education Committee is proud to announce its third Armenian Genocide Education Award Luncheon to be held on Saturday, March 23, 2019, 11 AM at De Luxe in Burbank, CA. The Luncheon will celebrate and honor K-12 educators from public schools who have gone above their call of duty to teach their students about the Armenian Genocide. The ANCA-WR Education Committee is seeking to find educators in all areas of education, throughout the states that make up the ANCA-WR, who have been committed to teach and spread awareness about the Armenian Genocide. Nominations may be submitted online at www.ANCAWR.org/educationaward before the deadline on January 11, 2019. All community members are invited to this event in order to show their appreciation, celebrate and honor educators for their dedication to teaching about the Armenian Genocide. Tickets and sponsorship opportunities are available online at www.ANCAWR.org/luncheonrsvp. Please make sure to reserve your tickets immediately as last year this event was sold out early. For additional information, visit www.ANCAWR.org/luncheon or call (818) 500-1918. The Armenian National Committee of America- Western Region (ANCA-WR) is a grassroots public affairs organization devoted to advancing issues of concern to the Armenian American community. For nearly a century, the ANCA-WR has served to educate, motivate and activate the Armenian American community in the Western United States on a wide range of issues.